Enjoy your favorite hot drink (or cold, if that's how you roll) in our punny ceramic mugs. 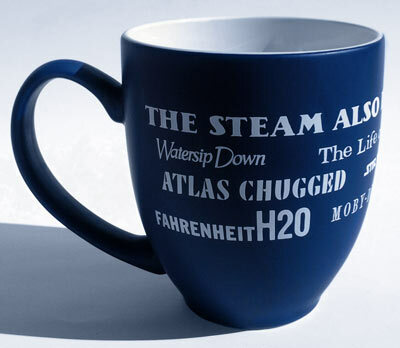 Each mug is covered with the typefaces from 11 iconic novels, refashioned into a literary drinking-themed pun. Because who doesn't like puns? (Nobody, that's who.) You can get yours in matte blue or glossy red, black, or gray. Long story short — we asked, you delivered. We were in the market for some new swag, and a new design. Plumbing the depths of our creativity, two booksellers put their heads together and came up with literary puns. And who doesn't like puns? (Nobody, that's who.) So we went to Facebook and asked you to lend us a hand. Over a hundred of you responded, and we picked 19 of the wittiest puns for our new travel cups. We reused part of that design for these mugs, with some tweaks and some new hot drink-themed puns.